One has to wonder… would anyone remember The Algerian War if it wasn’t for this movie? It’s hard for me to say, considering I am an uninformed American who was without any prior knowledge of this conflict that involved France and its colonial grip on the region now known as Algeria. I’m sure the war itself is more well known in Algeria (like, a lot more) and maybe France than this movie is. But whatever the case is, it takes this somewhat obscure international struggle, and turns it into one of the more gripping war films I’ve seen, and one that’s unlike any other I can recall from its era. If you’re wondering how gripping this movie is, it starts with a guy being tortured by a group of French military people, before they begin their raid on an apartment that seems to be of some importance. We then see a group of revolutionaries hiding from the military personnel behind the panels of a bathtub in the apartment, while the camera focuses on a young man named Ali (played by Brahim Hadjadj). The film then cuts back in time 3 years to the beginning of Ali’s involvement with the guerrilla fighters mobilizing against the oppressive French regime, who are known as the FLN (National Liberation Front). From there, we get to know the other fearless men and women involved in different acts around Algiers that could be interpreted as acts of terrorism. But as we see, are also acts committed in the name of freedom. One thing that director Gillo Pontecorvo went out of his way to do was to show both sides of the conflict equally. So in turn, we get to see the French military, led by the suave and charismatic Colonel Mathieu (Jean Martin), and even towards the end of the film we get a pretty good monologue of Mathieu trying to rally his underlings. And in the process, we do indeed get to see where these militaristic brutes are coming from. 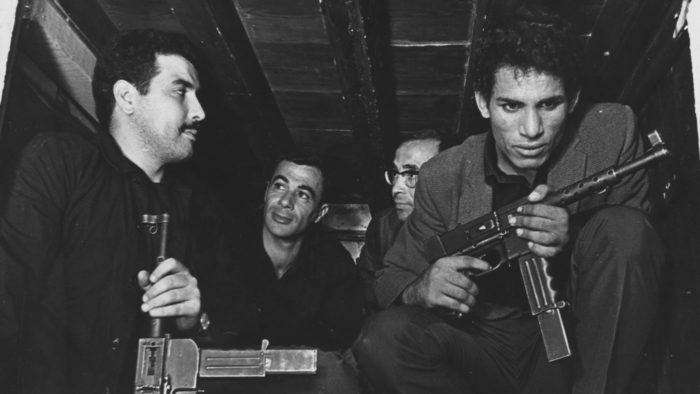 However, it’s hard to entirely say that the filmmaker ever quite makes the case that the French military are well-intentioned in their attempts to squash the efforts of the Algerian rebel fighters. I should probably stop talking about the social or political implications of what’s happening in this film, because I really can’t speak to them with much authority. What I can speak to is how kinetic and absorbing this movie is. Pontecorvo takes an approach clearly influenced by both Italian neorealism and documentary war footage, and turns it into something resembling an action movie, decades before action movies with this level of grittiness had become the norm. In fact, the movies that came immediately to mind while watching The Battle of Algiers were Kathryn Bigelow’s pair of middle east docu-thrillers, The Hurt Locker and Zero Dark Thirty. I think one reason this movie does hold up well, despite its indebtedness to a quainter kind of grainy docudrama, is it leaves room for numerous cinematic flourishes that raise the stakes. Among them is Ennio Morricone’s score, which like the work that would continue into the composer’s career, mixes the traditional with the unconventional. There are some stirring orchestral moments that compliment the more damning atrocities committed by the French. Meanwhile, an insistent mix of percussive instruments and guitar provide a sonic backdrop for the FLN’s more intense moments of planting bombs and whatnot. 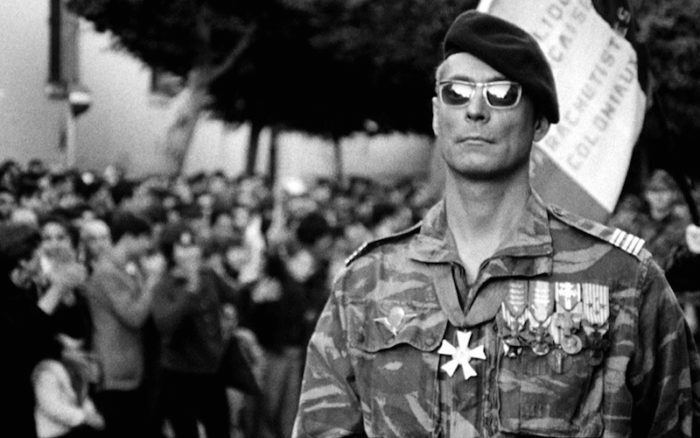 Another huge reason why I think The Battle of Algiers still feels pretty gripping is it just feels very – for lack of a better term – real. The fact that the movie was made so recently after the Algerian War (which ended in 1962) gives it the feel that the embers of the conflict hadn’t settled in the region (where the film was shot). There’s also the fact that the movie uses a mix of real and non-actors, while the bombings and explosions in the movie were clearly created without the aid of special effects, which adds a heightened level of danger to these sequences. Also, the film ends with an epic crowd sequence featuring what looks like thousands of extras. Overall, it’s just unique to see a film that’s so rough around the edges, but also has such an epic scope to it. Sure, you could make the argument that the film’s characters could be a little more clearly defined. But I won’t, since it’s hard not to feel empathy for them, especially when it feels like they’re living through a conflict that doesn’t seem too far removed from the ones we’ve seen in the decades since The Battle of Algiers.